MPC's Metalphoto Foil Labels and Tags are built to last in even the most demanding indoor, outdoor and industrial applications, with resistance to chemicals, abrasion, solvents, extreme temperatures and UV. Metalphoto foil labels are strong and lightweight, and are flexible enough to adhere to contoured or uneven surfaces. Metalphoto foil labels and tags are the preferred solution for asset tracking and product identification labels, property ID tags, instructional labels, safety/warning/caution labels, schematic diagrams, machine data labels, and more. Why Choose MPC's Metalphoto Foil Labels & Tags? Highest graphics resolution available on black or silver background. Color options are less resistant to UV. 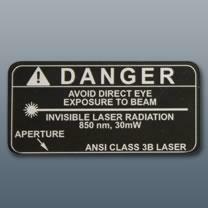 Photosensitive anodized aluminum face stock in .003", .005", and .008" thicknesses.